Toronto, December 20, 2016 - About three-quarters of working Canadians feel they have to put in extra work before and after a one-week vacation, reveals the latest ADP Sentiment Survey. And not just a quick bit of prep or catch-up: according to the survey, Canadians who are likely to do extra work around a vacation end up spending an average of 10 extra hours beforehand plus 11 hours afterwards, for a total of 21 extra hours. According to the study, before taking a one-week vacation, 75% of working Canadians will likely have to do some extra work ahead of time, with nearly half (44%) saying having to do extra work is “very likely.” Women are more likely than men to have to do extra work (49% vs 40%). After taking a one-week vacation, almost three-quarters of working Canadians (73%) say they will likely have to do extra work to get caught up again. 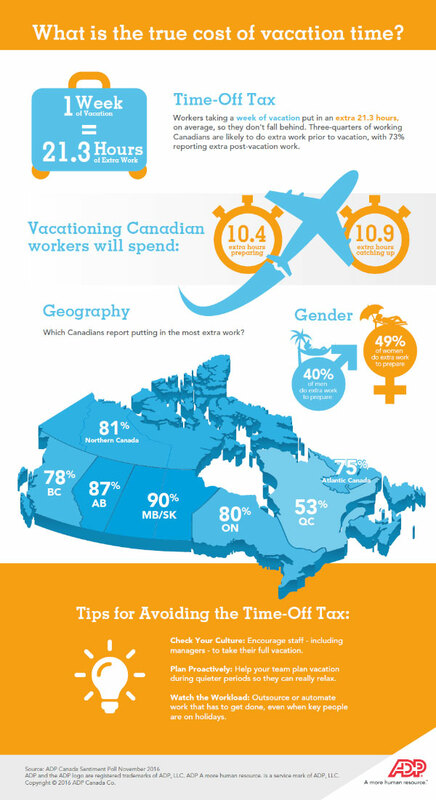 However, not all Canadians expect to put in extra time before or after a vacation. In Quebec, workers are least likely to put in extra time before a holiday (53% vs. 82% rest of Canada) and after (53% vs. 79% rest of Canada). In both cases, two-in-ten Quebecers indicate this isn’t likely to happen at all (23% vs. only 5% before and 4% after a holiday than in the rest of Canada). In contrast, Western Canadians are more likely to say they are putting in extra time before and after a holiday. Almost 90% of workers in Manitoba, Saskatchewan and Alberta report they are putting in extra time around vacations. Check your culture: Some workplaces breed a culture of overwork, whether it’s a start-up struggling to build their business, or a busy corporate environment where the work never stops. When vacations are viewed as a perk or lack of commitment, employees can feel compelled to “make up for it” on either side of a few days off. Managers should ensure employees take all of their vacation and can set an example by taking their holidays, too. Take the pressure off: Managers should make sure they have a realistic view of their employees’ workloads and commitments. “A lot of managers have a blind spot when it comes to schedules and workloads,” Brailey adds. “If you have employees on your team whose work is essential, it’s important to make sure they have a back-up so they can take time off without worrying.” Hiring contractors to cover vacation time or outsourcing some functions are other approaches organizations use to make sure the work gets done while allowing employees to recharge. Solutions such as ADP Workforce Now® can help automate vacation management and provide line-of-sight into resource gaps. A survey of 1554 Canadians was completed online between November 21 and 24, 2016, using Leger’s online panel, LegerWeb. Of that 1554, 808 respondents could be classified as “working.” A probability sample of the same size would yield a margin of error of +/-3%, 19 times out of 20. 1 Survey by Northstar Research Partners among 1,006 Canadian adults aged 18 and older who are employed or self-employed, conducted between August 22 and August 31, 2016.